That clearly is an open-ended question because the answer will single out the uber-sophisticated pistons designed for Formula 1 and World Endurance Challenge (WEC), yet to be completely literal the response must acknowledge hand-modified cast factory pistons used in Hobby Stock racing at the local dirt track. For the sake of argument, let’s define a racing piston as one that works best for any builder assembling an engine for motorsports competition. From there the discussion can move toward more specific talking points. “Typically [a racing piston] is a highly developed design that has undergone many iterations to optimize its use under a very specific set of conditions,” said Alan Stevenson, senior technical account manager. There is a lot that goes into a purpose-built racing piston, such as this Top Fuel slug. Primarily a racing piston is designed around a specific application and accommodates design features to uniquely adapt it to that application. A simple comparison of pistons from the muscle car era of the ‘60s to today’s more advanced products will certainly validate that position. Manufacturers have improved materials and designs through advanced computer modeling to improve power and increase fuel efficiency. 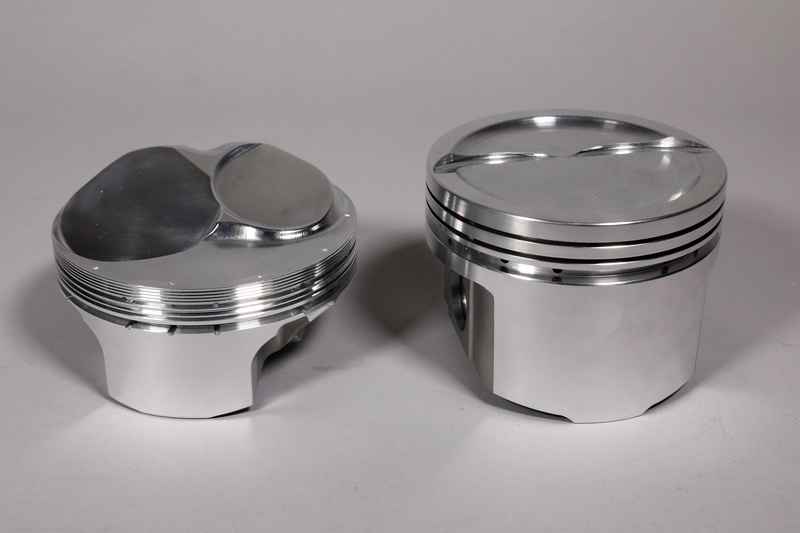 Forged pistons can be made of either a forged blank (right), where the entire shape of the piston is machined out of a forged aluminum cylinder, or created from a net forging that is squished closer to its final shape via a forging die. Read more about the piston forging process HERE. Low-power engines can survive with cast pistons since they won’t see the abuse of blistering heat or high RPM. There’s not much you can do to improve performance with a cast piston, other than grind out a little metal in the crown to clear the valves if a more aggressive camshaft is installed. In the ‘80s and ‘90s, hypereutectic became a big buzzword in the piston industry. A hypereutectic piston is one that has greater than 12.5 percent silicon in its metal composition, usually around 16 to 18 percent. A standard cast aluminum piston has around 8-to-10 percent silicone content, which improves the hardness and helps reduce wear around the ring grooves, skirt and pin boss. 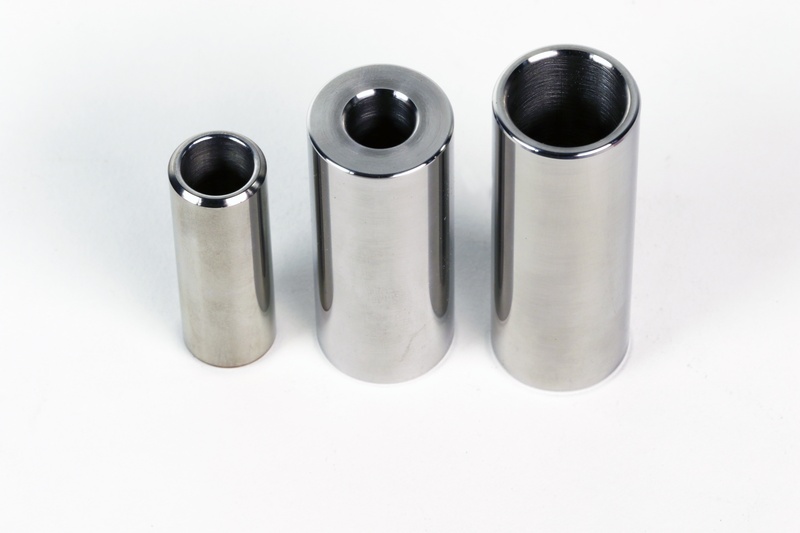 The hypereutectic piston is still manufactured through casting but the alloy is a little lighter, and due to the improved strength the casting can be machined a little thinner to cut down even more weight. 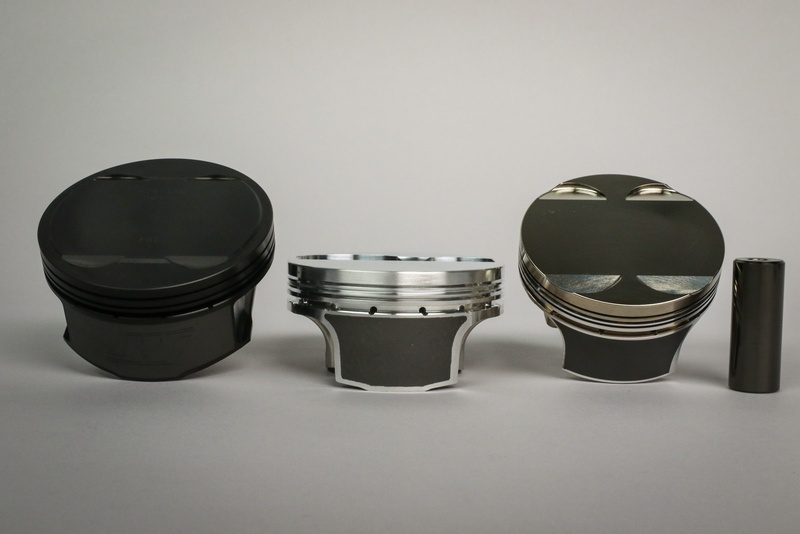 Forged pistons are made from two different materials, 4032 and 2618 aluminum. Each has a unique list of pros and cons that make it the preferred alloy for different applications. 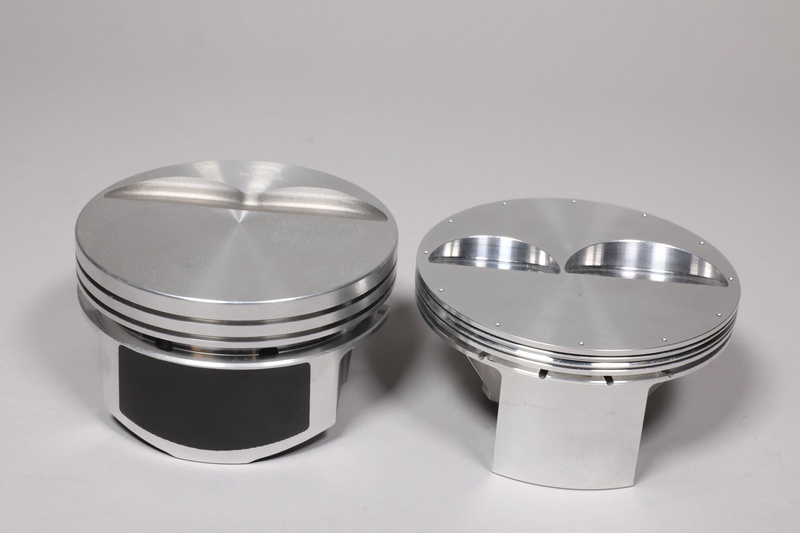 Still, a forged piston will be much stronger and that’s why it dominates the performance market. There are two aluminum alloys popular with forgings: SAE 4032 and SAE 2618. Here’s where another choice is made that often distinguishes, or at least makes a good argument, for a racing piston—although one alloy isn’t always “better” than the other. Again, silicon content is the differentiating factor. A 4032 piston has about 11 to 13 percent silicon while 2618 has less than .25 percent. “2618 has higher ultimate strength, better annealing resistance at elevated temperatures and has better ductility. In a racing environment, the goal is often to minimize weight without sacrificing durability in high-heat environments. For these reasons 2618 often gets the nod,” continues Stevenson. The piston on the left uses a 5/64in ring pack. This is a very common size used during the muscle car ere. 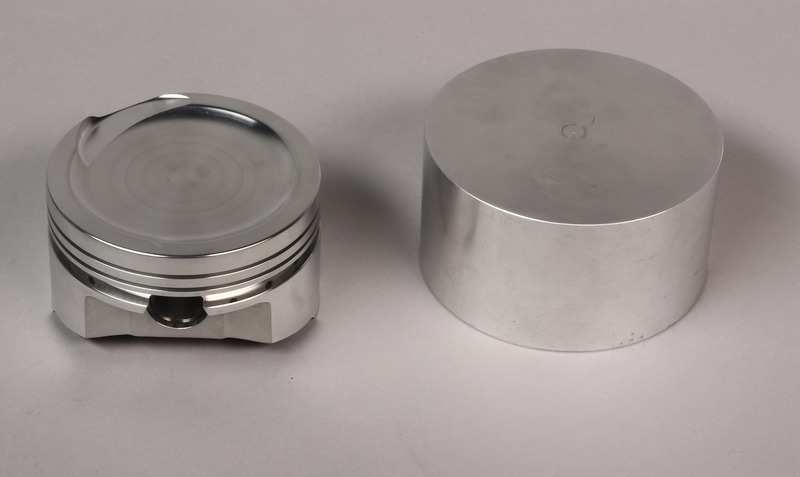 The piston on the right uses a much thinner 1.2mm top ring. This reduces friction, freeing up horsepower and allowing the engine to rev quicker. While a majority of racing pistons are made from 2618 aluminum, there are some exotic materials used in high-end racing—or at least they were tried before being banned. Aluminum beryllium alloy, which is exceptionally light and strong with superior thermal properties, was developed by Mercedes/Ilmor for the McLaren Formula 1 team in the late ‘90s. However, the alloy was quickly banned because beryllium dust is extremely hazardous, and in a fire the element will turn into beryllium oxide, which is extremely toxic. The latest advanced alloy to draw banishment in motorsports is aluminum metal matrix composite, or MMC. Another very stiff, lightweight alloy, MMC is also banned by Formula 1 but continues to draw interest in other areas of motorsports where the rules are more open. 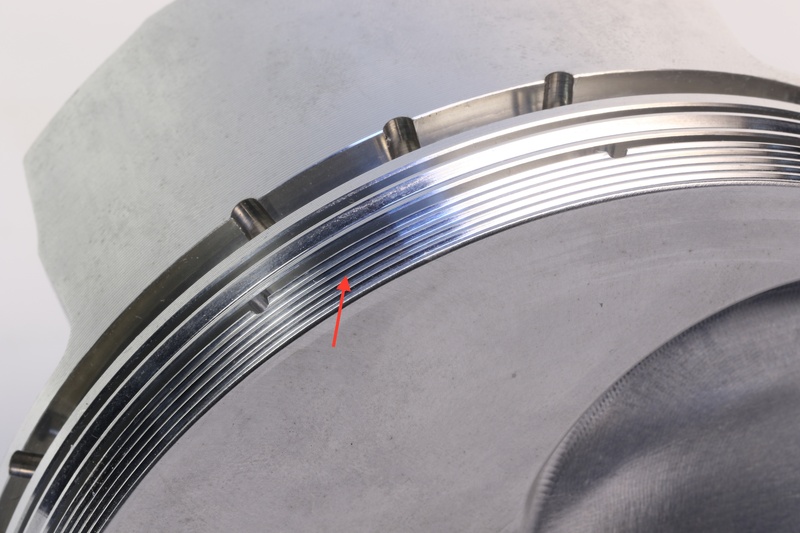 Thinner piston rings made of better materials are often a component of racing pistons. The top-ring, pictured is made from high-carbon steel and comes in at .043in thick. That’s a well-circulated dime on the left for comparison. In other words, billet pistons are primarily used in tight-timeline development projects where critical changes can be made quickly without worrying that a proper forging isn’t available. The debate over billet vs. forged in terms of strength will have protractors and detractors on both sides, but generally speaking, a properly executed forging will have inherent strengths in grain structure that a billet piston will not. “Probably 98 percent of racing formulae have a forged option available in the aftermarket,” confirms Stevenson. Anti-detonation grooves (left) are designed to disrupt pressure spikes caused by detonation. Accumulator grooves (right) provide additional volume below the top ring so pressure doesn’t build up and attempt to unseat the top ring. Although some exotic engines run 2-ring packages, the majority of racing applications stick with the tried-and-true 3-ring setups. What has changed dramatically is the thickness of those rings, especially in Pro Stock and other non-endurance engines. “You reduce friction and mass, freeing up power and allowing the engine to accelerate faster. The secret to power in any N/A engine is to use the thinnest rings possible, lapped flat and matched with a super-flat ring groove, and ensure minimal axial and radial clearance,” adds Stevenson. Wrist pins serve a pivotal function, but they are also heavy. Choosing a width and wall thickness that is applicable for the engines application is paramount. A high-winding circle track engine will likely have a light-weight, premium-alloy wrist pin, whereas a turbocharged drag engine will favor a heavier wall pin for added strength. 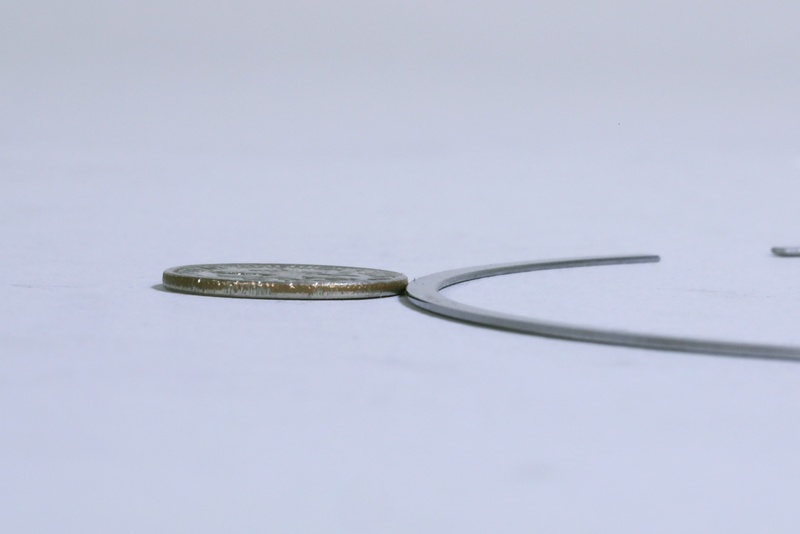 Less weight is always desirable but using a smaller or thinner wrist pin may compromise strength and engine durability. “This often comes at a cost of using better, more expensive materials but also reduces mass to help the engine accelerate faster,” adds Stevenson. Shortening the piston skirt is a good place to remove mass, but also can be mandatory in stroker applications. 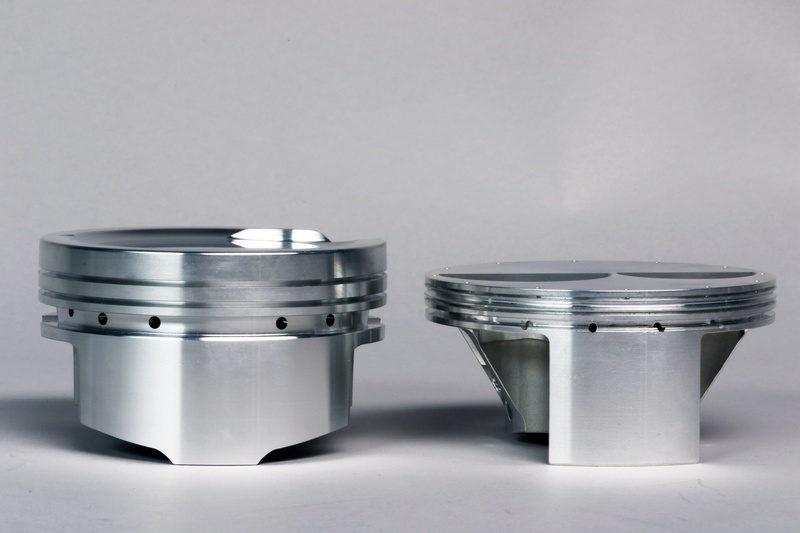 Racing pistons also have different skirt profiles to help them stay stable in the bore at high rpm. Again, more design changes to reduce weight and friction but these efforts are usually dictated and restricted by the engine architecture, such as length of the cylinder sleeves and the stroke. “The gauge point of the piston skirt must remain captured in the bore at BDC,” said Stevenson. 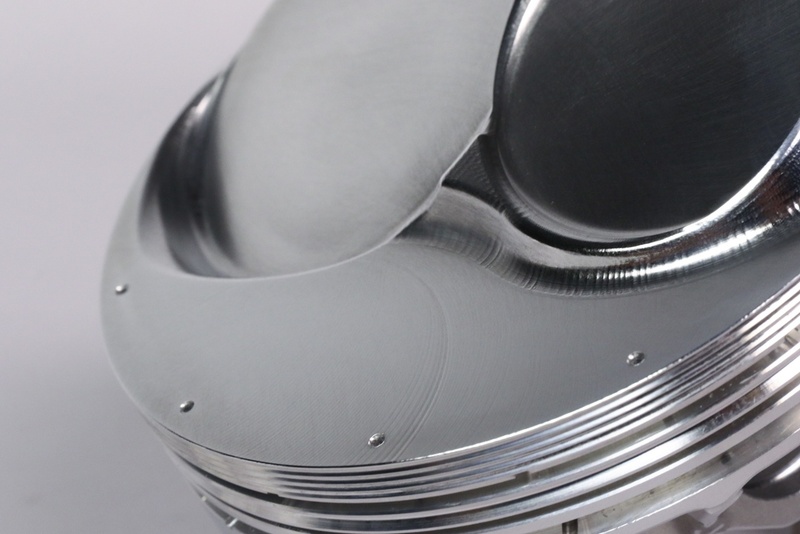 Thermal and skirt coatings are designed to increase piston longevity and increase horsepower. To learn more about all the different coating types and how they work, click HERE. Some engine builders want to reflect the heat away from the piston, preferring that the valves and cylinder head dissipate the heat to the coolant instead of the pistons and rings through the cylinder wall. Thermal coatings are designed to repel heat from the piston crown, and in some cases the combustion chamber as best as possible. “By far the most friction in an engine is from the rings. A distant second are the bearings. Skirts have minimal friction since they ride on an oil film,” says Stevenson. On racing pistons, top teams use coatings as an insurance policy against overheating. In OEM and daily driver conditions, they are used to protect against dry starts and other situations where oil on the cylinder wall is limited. 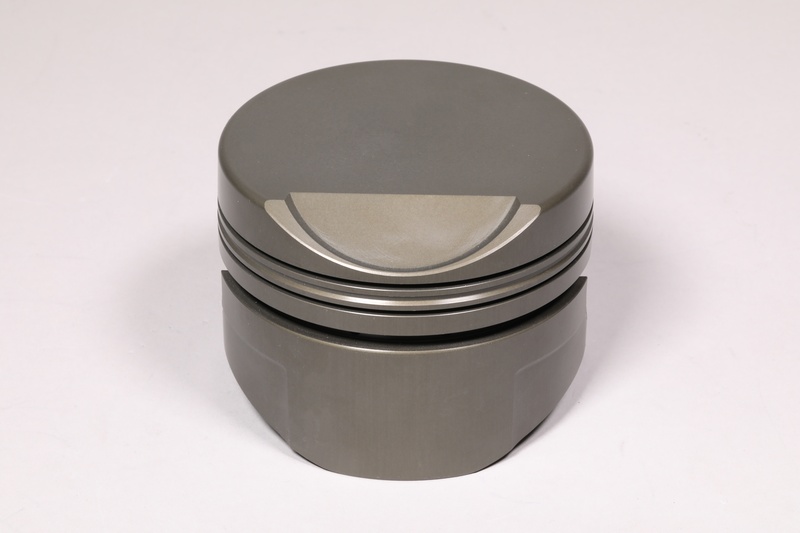 This piston features vertical gas porting which allows combustion pressure to get behind the piston ring, forcing it into the cylinder wall and increasing ring seal. It is most commonly used in drag racing applications. 3D profiling is a precise milling procedure where the piston crown maintains the same thickness regardless of the dome profile. This step ensures that the crown has the necessary strength and heat resistance for competition with the least amount of weight. “This is especially important when trying to maximize compression ratio, and it can also be used around valve reliefs to promote smoother flame travel,” adds Stevenson. The actual crown design and valve relief dimensions will be dictated by the combustion chamber and valve geometry. Another racing piston cue is that the engine builder will send a mold of the combustion chamber to the piston manufacturer so that the dome design exactly follows the profile of the chamber. Finally, some engine builders call for very slight adjustments in the overall piston shape and dimensions to suit their needs. “Skirt cam/barrel shapes and ring-land diameters are part of the black art of optimizing a design during a development program,” says Stevenson. 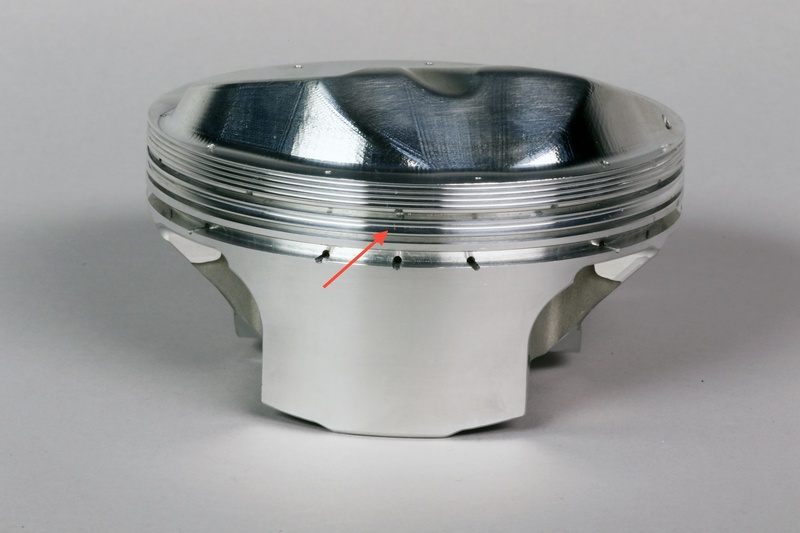 As you can see, a racing piston may have one or many of the features and modifications mentioned. The key is designing a piston that meets the needs of the engine builder assembling an engine for a specific competition.